NOTE: Please note that all the above sizes are in millimetres (mm). NOTE: This electric product requires a 13amp socket to plug into on installation, and the heat is provided by a fan heater under the fire as shown in the picture above. ² This is Dimplex Low Energy Bulb lifespan is according to 2007 research assuming fires running for 5 hours a day 7days per week. 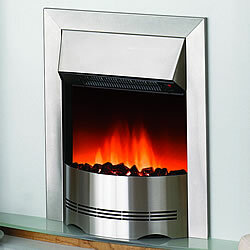 Optiflame LED fires use low energy LEDs in the fires lighting and flame effect. These products can easily be installed by a qualified Electrician or competent Builder or Trades person. It is recommended that this fire should not be used as a sole source of heat rather as a secondary source in conjunction with central heating. All information contained in the website is to assist in your choice of a suitable fire. 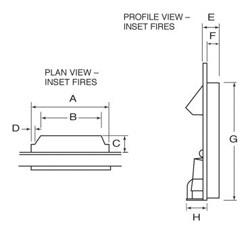 This is not intended to be all the information required to install your fire. This can be obtained from Dimplex themselves.